#farmstand is here at #aihfs today! 1st and 3rd thursday, 3 to 5pm . Fresh produce for a healthy community. Has #spring finally broke through? Today #AIHFS participated in #indigenouspink day. It is a national breast cancer awareness campaign for American Indians and Alaska Natives. Having fun and respecting others leads life to a healthy way. Live life the Dreamseekers way. The past 3 years I’ve visited my family in the southwestern united states, I’ve noticed animal themes. These themes may even have been happening during prior years, but I never noticed them. By themes, I mean various things will come together as part of my trip that are traits associated with an animal: colors, imagery or even weather. Two years ago the buffalo was the theme. There was a lot of snow when I went to Albuquerque, Santa Fe and Taos. My dad, a Taos Pueblo American Indian, used to say that you only should do the buffalo dance at certain times because you will make it snow. I even received a pendant with a buffalo on it. Last year it was the wolf. While in Phoenix visiting my mom, sister and nephews, I went to a flea market specifically looking for a lightweight jacket. I almost gave up, but my mom asked around and the only jacket they had with an animal on it was a wolf. As an American Indian, we have our clans and try to wear it as a message of our clan to others. There are reasons for that which I won’t cover here because that deserves its own article. Since that wolf jacket was just what I was looking for in every other way, I bought it. This most recent time, which was last month, I feel my animal theme was the hummingbird. On my last day in Albuquerque, I purchased something intuitively. At the center of the design was a hummingbird. After the purchase, someone asked me if the hummingbird had any special meaning. I realized I had been caught off-guard and was not familiar with any stories related to it. I said that I had seen it used amongst Michigan tribes some, but more so in the southwestern United States. With that, I began my search into the different meanings and characteristics of the hummingbird. Liking videos more so than reading, I began my search on YouTube and found a lecture posted by University of New Mexico – Digital Media Arts, no less! From this lecture by Dr. John Ubelaker you get a scientific explanation for why the hummingbird will always look for the red flower and migrates great distances every year. Also, he said they have evolved together. When the hummingbird drinks the nectar to fuel its very high metabolism, it also gets pollen on itself and that will transfer to the next red flower. Why red? Well, they can distinguish red vibrates at a higher frequency level than blue so they seek more energy because they need so much energy. Every year around this time they start their trip from Central America to North America. They can travel about 20 miles a day. Some other interesting facts about this little bird is that it has 1000 feathers and each has a neuron attached to it. What that means is that each feather is individually controlled. No other bird can do this. Another fact that I found amazing is that the color of the feather is determined not only by pigment but also by structure. This accounts for the shimmering effect the feathers seem to have as the bird moves through the air. My own observation is if you believe, as I do, that plants have spirits, then this red-flowering plant must certainly understand that it has a special relationship with hummingbird. If something helps you “evolve,” then you must certainly love it too. In the video, The Legend Of The Hummingbird, posted by YouTube user Morgan1121, she shares a story that comes from the Indigenous people of Puerto Rico. In it, a young woman and a young man from opposing tribes start to fall in love by a pond, but the young lady’s father finds out and he begins arranging a marriage to someone else. The young lady goes back to the pond and asks for help. She is changed into a red flower and tossed into a field with other red flowers. Later, the moon instructs the young man not to wait for her any longer. The moon then explains what has happened to the young lady. He asks her for help and she changes him into a hummingbird. He begins flying to each of the red flowers in search of his lost love. The next morning the people of the village saw this new bird and gave it the name hummingbird. From this story, you get an explanation for why the hummingbird will always look for the red flower; it is not describing migration, it is telling us about the search for love. Another story about the role of the hummingbird comes from a YouTube video called, “How Hummingbird Got Fire,” which features Valentin Lopez, Chairman of the Amah-Mutsun Ohlone tribe of California. Their traditional tribal lands included what is present day Santa Clara County, south of San Jose. This area includes the 4th highest peak of California’s Santa Cruz Mountains and is called Mount Umunhum. In fact, it turns out the name itself is from the Indigenous tribal language group, Ohlone and it means, “resting place of the hummingbird.” Once again, the hummingbird is strongly associated with this migration it makes every year. I will not share too much about the story because it’s worthwhile to watch the video when you have a moment. In this video the eagle asks hummingbird to bring fire. My take away is that the hummingbird is seen as a representative of the bird tribe, which means they are respected individuals. In this case, the hummingbird brings fire to their tribe, which could be a simile to spring bringing warm weather. 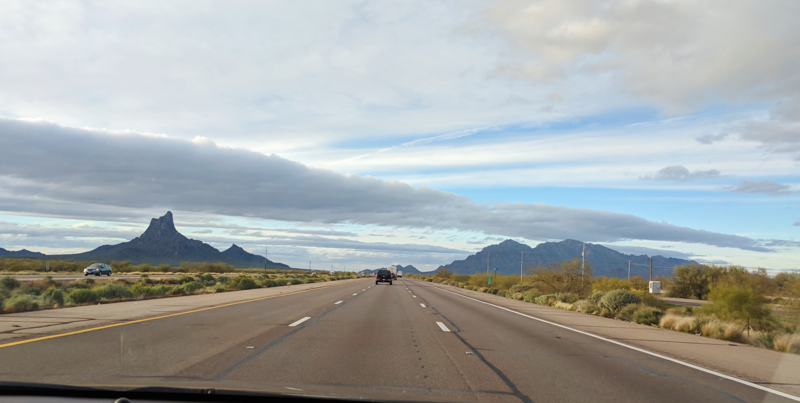 As I wrote this blog, a memory of seeing an old black and white picture hanging up in a hallway display case of the Saginaw Chippewa casino popped up into my head. I saw this around 8 years ago. The picture was of a large group of natives in intertribal dance regalia. The stage appeared to be a drum, a very 1950’s style of set design. The casino had put text with the picture to give it context; I believe it said the picture was a performance of the hummingbird dance. As I studied the picture closely, I was pretty sure one of the guys in a “war bonnet” holding a drum was my great uncle Teofilo, my dad’s uncle from Taos Pueblo. Teofilo had moved to Detroit prior to the 50’s so it was a strong likelihood to be him. Then I thought the dancer on the drum actually may have been my dad. 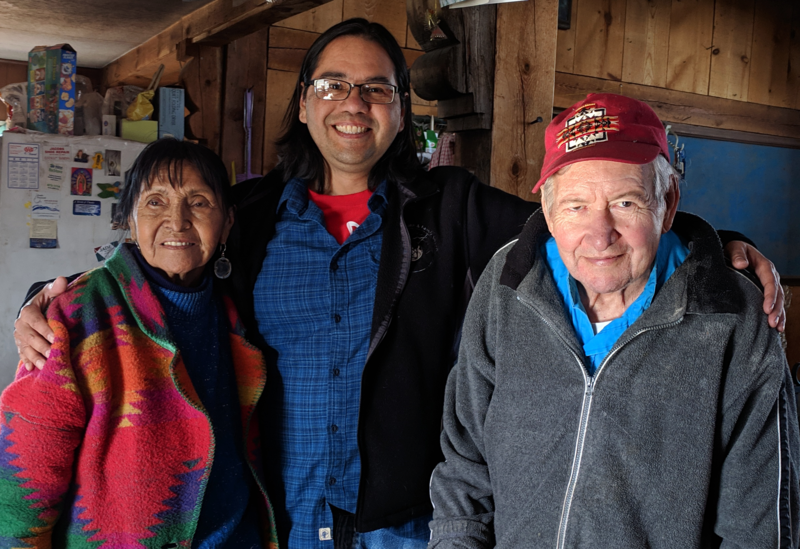 I heard many times from my mom and dad about a place in northern Michigan that they would go to demonstrate Native American dancing when they were younger. I called my mom to ask about that era, which turned out to be the late 50’s. Sure enough, she said my dad did perform the hummingbird dance at Chappell Lake, near Tawas, Michigan. The background on Chappell Lake is that a couple had relocated from New York City, where they had worked in theatre, and made this outdoor Native American dance theatre. They hired Native Americans as the performers. It was probably a nice change from picking fruit, as local Native often did to make a living during those days. Since my dad, born and raised in New Mexico, did end up marrying my mom, I guess you could say the hummingbird was once again a part of migration and love. Was this another red coincidence or just more enforcement of this theme? 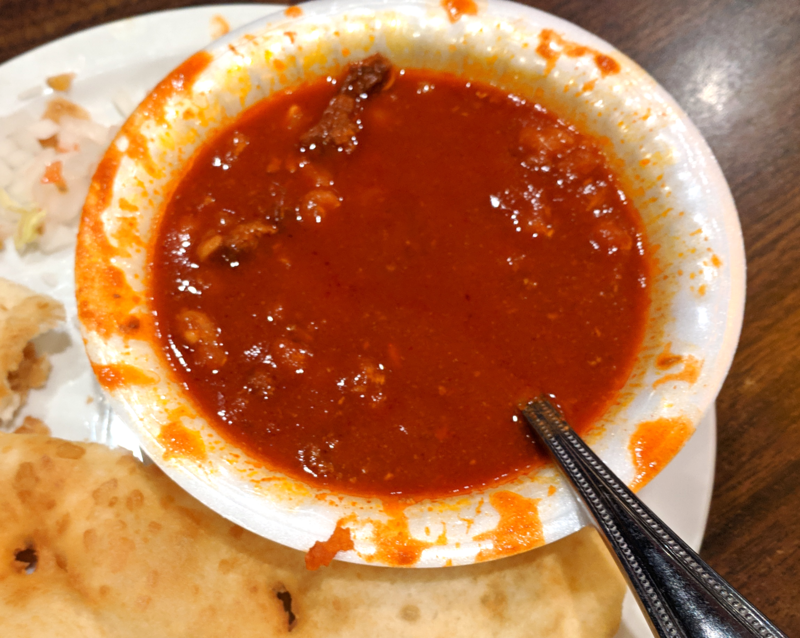 After returning to work, our CEO, Ashley Tuomi, asked me if I had eaten a lot of green chilis, as I had on my previous trips, and I thought about it a minute and realized I did have some, but I actually had more red chili than green this time. When I started back on the job one of the first things I had to do was get started on our quarterly newsletter here at AIHFS. One of the big choices for that is deciding on the cover design. I usually try to use a big agency event that is coming up or has recently happened. Even though spring is not an agency event, I know spring has been on everyone’s mind since we have had a harsh, cold winter. So, I thought that would be a good theme and it did not take long for me to know I wanted to use the hummingbird to represent spring. This was long before I even thought about writing this blog. After several drafts, I ended up creating the following design, which you will also find on our latest newsletter when it comes out. 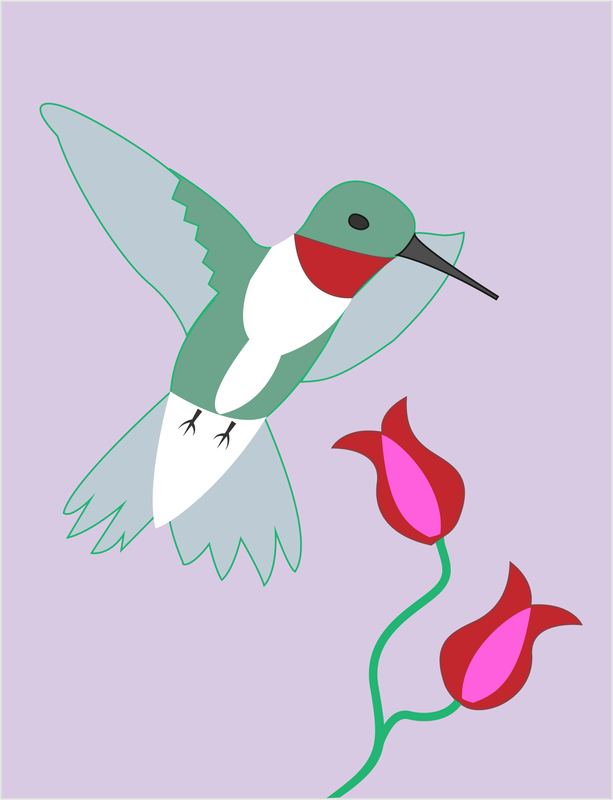 In summary, the hummingbird is associated with love, spring (warmth), migration and red. One of our Native American core characteristics is humility. In this region, humility is one of the Seven Grandfathers Teachings. Here are the other six: bravery, honesty, wisdom, truth, respect and love. With this understanding, I thank the hummingbird for sharing these things I have learned from it and I thank the creator for putting these teachers in our path when we need them. As mentioned earlier, right around now the different types of hummingbirds are making their way up from Central America and will be looking for that red flower to help feed them on their journey. As a way to pay back what they have taught me, I think I will look into planting a couple of hearty red flowers that will keep growing every year. By the way, from that lecture I learned that these birds actually remember each year where these flowers are that they fed from previous years. Does anyone have any recommendations for what red flower has done well in attracting (feeding) hummingbirds? Watch for an update where I’ll share a picture of the plant I planted, and if I’m even luckier, a picture of a hummingbird actually feeding from the plant after it’s been planted. Special thank you to Nickole Fox, Director of Community Wellness, for helping with editing. I just loved reading this blog entry! Great writing and thank you for the teaching. I have found that hummingbirds really like the trumpet vine in my yard. It is a flowy vine with red and orange trumpet shape blooms that come out in mid to late summer. I also have observed that hummingbirds love bright colored petunias. The my summer culture camp in Three Rivers, Michigan we plant petunias in all the flower pots and also in pots that are on the cabin deck railings. All the cabins are in a row and it’s a joy to be sitting on the deck and watch the hummingbirds fly from cabin deck to deck enjoying each individual pot of petunias. When they finally get to the deck I am sitting at, it’s like having a bird rock star visit! It’s so fun to see them so close. In my yard I see them also enjoying BeeBalm, Butterfly Bush, Cardinal Flowers and Foxgloves. Here is a list I found- https://birdwatchinghq.com/hummingbird-flowers/ Migwetch for such a great blog entry. Best wishes on your garden hummingbird oasis! Thank you for the comment, Brita! You have given me a lot of good choices for what to plant. I especially like when you get to feel like a bird rock star, lol. Loved the blog. I agree w Brita regarding the trumpet vine. Any flower that has o trumpet shape. Even 4’oclock flowers. Hugs to you and your family. Thanks, j montour! I appreciate that you read it and the feedback on flowers. Hugs back! Thanks, Auntie! I am glad you liked it. My family is lucky to have you in ours, as well! Thanks for using those traditional words. That is something I still need to work on. John, thank you for the wonderful story. It came to me at a ripe time for learning and was much needed. A couple side notes, I visited Taos Pueblo last year during a feast time and was fortunate to learn about some of your heritage. I really enjoyed my time in Taos and can’t wait to go back. Secondly, my Dad was recently telling stories and spoke about how he at 13 years of age would hitch hike from Petoskey all the way to Tawas to dance at the same place your Dad did. Sure was a different time back then. Thanks, for the comments, David! Yeah, I’m glad you made it to Taos. It is a special place, especially during feast times. Also, really glad to hear your Dad also had participated at Tawas. I know only a few others and I didn’t want to mention their names without asking permission. Googling the subject will return basically no info about it, so good to know someone else with that shared history.